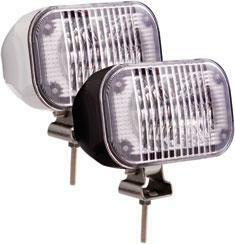 Heavy duty LED light illuminates reflective surfaces at over 500 yards but draws only 0.683 amps. Dual power - works with both 12VDC and 24VDC systems. Rugged, weather proof design suitable for fresh and saltwater applications. Features die cast aluminum housing coated for protection against corrosion and UV exposure. Gasketed lens and wiring for weather proof performance. Impact resistant polycarbonate lens. Fully adjustable corrosion resistant stainless steel mounting bracket and hardware. Design includes both lead wire and ground wire for mounting to all surfaces. Crystal Clear lens.